Life and plans change fast, especially when working short contracts for Outward Bound. 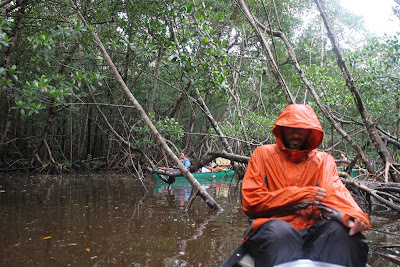 That is how I recently found myself in the Florida Everglades. A phone call telling me my work was no longer but that I could attend a staff training, a flight to Alabama, a day at our base in Alabama, a car ride for 7 hours with someone I didn’t know, another day at another base, another road trip (this time with 6 people I didn’t know), another day at another base then three hours back in the van and I was getting in a canoe that I was not to leave for the next 5 days. I’ll say that again. A canoe I was not to leave for the next 5 days. The course area in the Florida everglades does not have land. None. Well none that we used until we stood on highland beach in the gulf of Mexico. The system is simple if a little weird. paddle all day with all the gear stored on top of the boards in the bottom of the canoes, anchor for the night, get the boards out from below all the gear, put them on top, tie it all together, and do all normal camp stuff on the boards. 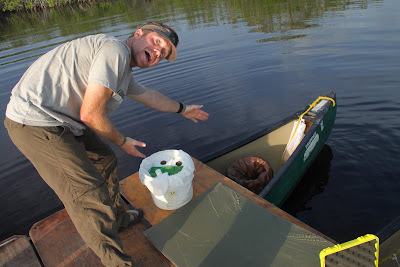 For the Canoeists – the boats we used were 18ft Trippers in which we had an assortment of gear with boards hidden underneath (the boards are 2 x 8ft and were possibly developed as a system by OB down here). The photos. 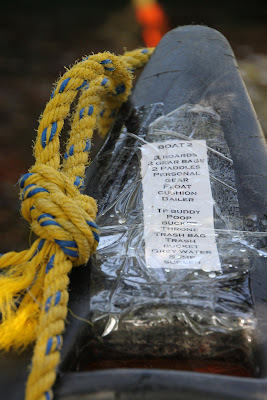 Organisation – list taped to bow of the boat so you know what you should have and where to access things with the boards on top. 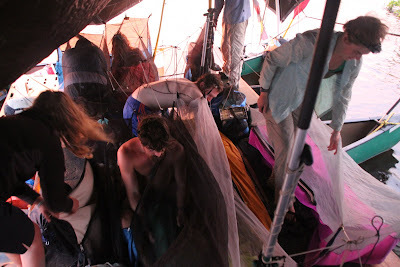 Getting up in the morning – everyone has 2 x 8 ft of space with all their sleeping gear including “healy hammock” (a bug net). 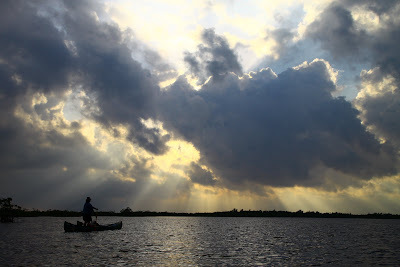 very hot, very buggy and very awkward getting in and out of your healy……..
Amy solo paddling into late afternoon light as we head further towards the gulf of Mexico. 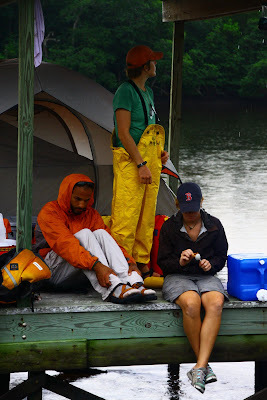 On a chickee (platforms you can book to camp on) waiting for the lightning to pass and the tides to change. 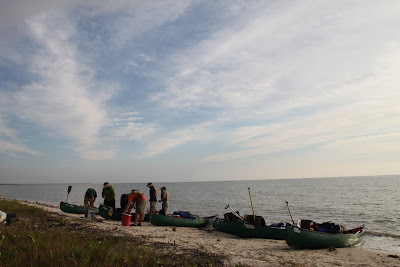 About to set of on the last paddle into the gulf of mexico. 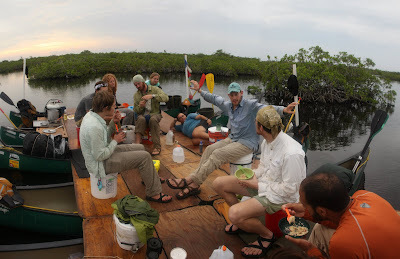 our last “day” comprised of 37 miles (nautical miles….) lots of navigation, lots of darkness and lots of paddling. Setting off at 4 pm we paddled till 7pm slept on the beach for 4 hrs then paddled through the night and dawn to our take out at 9am. The boards in place. This was the living space for 12 of us. All of us! We met this rather large “crocagator” (10ft!) at night. 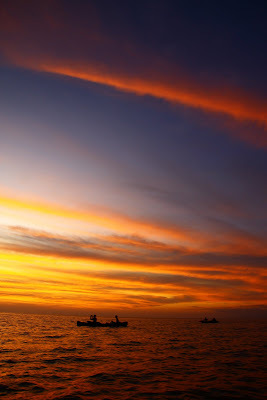 This was taken with my lens set at around 30mm. A little to close I think. Final assesment is that it is a Crocodile.